Those delicious looking cannabis flowers peeking out from under the display in a marijuana dispensary don’t look that way by accident. Marijuana bud trimmer salaries reflect a shift from predominantly black market sales to a newly legal, highly regulated cannabis industry in more and more regions around the United States. Bud trimming maintains unique importance in the history of cannabis cultivation and distribution. For decades, trimmers have swarmed to marijuana meccas in California, Oregon and surrounding region to work hard and make fast cash. 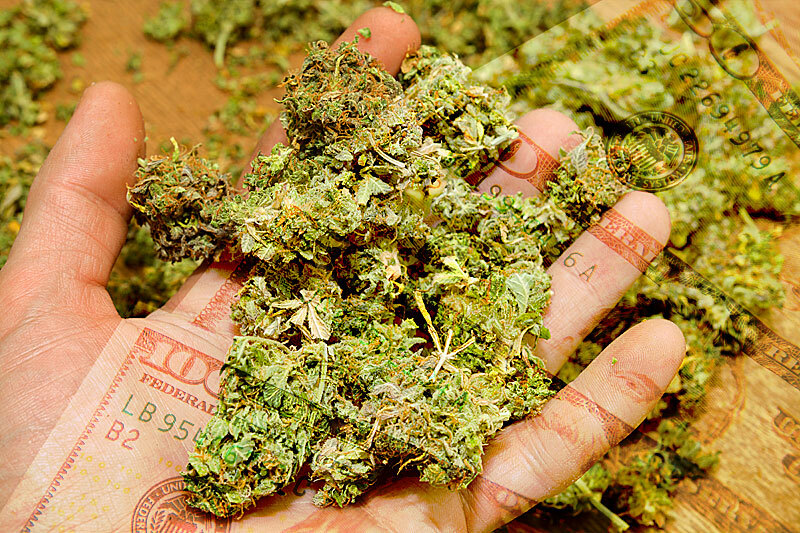 Under illicit operations, marijuana trimming jobs represented a world of possibility for travelers, cannabis fanatics and anyone else with limited time and debts to pay off. Trimming increased in popularity once cultivators realized that most of the essential compounds present in cannabis secreted in glands on cannabis flowers. While the rest of the plant, such as sugar leaves, do contain some cannabinoids and terpenes, they appear in much smaller concentrations. Trimming isn’t necessarily a difficult task per se, however, experienced workers have the potential to make significantly higher incomes than novices (especially when weed jobs weren’t taxed). Once a crop has been harvested, trimmers begin the “wet trimming” process by removing any and all excess plant matter or “trim” from the resin-covered buds. Before there were machine trimmers, cultivators had no choice but to employ real people, paying individuals decent wages for their consistent, quick work. While this position is considered one of the more menial, repetitive marijuana jobs out there, it requires energetic employees who can perform the same task without losing steam over a full day’s work, which can sometimes be as long as ten to twelve hours per day in peak season. So, why is it that trimming is so important to the cannabis community? The answer to this question is threefold: compound concentration, beauty and harshness/taste. As briefly mentioned above, the primary reason for trimming cannabis plants is to optimize the levels of cannabinoids like THC and CBD, as well as terpenes, which are the pleasant, aromatic compounds that protect plants from predators, give flowers a great taste and provide medical benefits to consumers. From a consumer perspective, well trimmed bud is the first sign that the product they’re about to purchase maintains a certain level of quality assurance. Far too many times, smokers have purchased illicit cannabis that wasn’t worth its price, containing excess sugar leaves, sticks, stems and even seeds. This is a telltale sign of a poorly processed crop and is not worth your money. Now that legal cannabis has ushered in more consistent standards of flower quality, customers only want to purchase flower that will give them the biggest bang for their buck, especially since legal weed is highly taxed and largely more expensive than buying off the black market. Another result of cannabis legalization on marijuana bud trimmer salaries is the market’s desire for aesthetically pleasing products. Cannabis dispensaries usually offer a wide variety of cannabis flower strains, as well as concentrates, tinctures, edibles and more. For this reason, cultivators have to keep up with competition by processing eye-catching buds that lure customers away from other merchandise. Cannabis can be both over trimmed and under trimmed, making it important that trimmers are consistent and confident in their work. Marijuana bud trimmer salaries are contingent on quality work and can range depending on speed and efficacy. An important factor that plays into a trimmer’s daily work is the taste and harshness of the flower. If bud is trimmed too loosely, containing sugar leaves and additional plant matter, it will likely emit a harsher smoke and a more plant heavy taste. This is because plant matter contains unnecessary elements apart from essential compounds. Chlorophyll, lipids, waxes and sometimes pesticides exist within plant matter and the more of it there is contributes to a more earthy taste, taking away from tasty terpenes. For this very reason, cannabis concentrates have become increasingly popular among consumers looking to get their fill of cannabinoids, without breathing in unsavory additives. Concentrates are made by extracting compounds from plant matter by introducing solvents like CO2, heat and pressure to form oily, waxy, crumbly, amber looking “dabs” that can be consumed a number of different ways. If grow operations want to continue cultivating and selling flower successfully, they will need to make sure that they hire good trimmers and compensate them with competitive marijuana bud trimmer salaries. The legal cannabis is still in its fledgling stage and as such, marijuana bud trimmer salaries vary depending on the employee’s locality, whether they’re part or full time, and the staffing needs of grow operations, dispensaries and processing centers. On average, trimmers make hourly wages anywhere between $12-15 and above. While these wages aren’t as competitive as those working marijuana dispensary manager jobs or other leadership roles, they are significantly higher than other entry level positions both in and outside the marijuana industry. Experienced trimmers who can process huge amounts of manicured flower in short periods can make upwards of $20 an hour, or even salaries as high as $50,000. Like any job, trimming presents both pros and cons for interested applicants.On the plus side, this is one of the best marijuana jobs for introverts — workers are not responsible for any direct customer service tasks, nor do they interact much with other employees on a regular basis. Additionally, trimmers can listen to music, podcasts or audiobooks while working, as long as it doesn’t take away from their efficiency. A great perk of working as a trimmer that has outlasted the black market into the legal cannabusiness is free and/or discounted cannabis flower and trim. After all, what better “tip” can a cannabis enthusiast receive than a huge bag of bud to do with as they please?! Many of the cons associated with marijuana bud trimmer salaries have to do with the long hours spent sitting or standing and the mundane nature of the job. While a great pursuit for those looking to work alone, those with more extroverted inclinations may find themselves bored, staring at the clock all day. Additionally, trimmers risk staining their clothes and hands with sticky resin, which is why most wear disposable gloves to avoid excess staining. Ultimately, trimming has sustained its legacy as a viable career for those looking to break into the industry. Although the marijuana bud trimmer salaries of legal workers may not measure up to black marketers, legal jobs promise a payout and (hopefully) limit the frequency of bosses taking advantage of their workers. Under black market operations, some trimmers were worked to the bone, without being treated fairly or paid decent marijuana bud trimmer salaries. Additionally, there has been prevalent sexism throughout the legal and illicit industry where cultivators will hire only female trimmers, and pay them less than the industry standard. Trimmers are given the opportunity to work directly with cannabis and interact with industry leaders. Trimming acts as a fantastic springboard for launching entry level workers into high ranking cultivation and processing jobs, such as concentrate and edibles creation jobs. Below, we’ll delve into some common areas where trimmers will progress to as they move forward in their careers. Not surprisingly, many trimmers wish to use their experience to build their credentials in order to lead grow operations. Master growers are cannabis experts that use their knowledge of horticulture and cannabis to plan and execute protocol for raising a successful crop from seed to harvest. Grow masters must be assured of their methods and have the ability to maintain their plants, while protecting it from the threat of pests and disease. Some common tasks assigned to grow leaders are germination, setting up soil or hydroponic growing systems, feeding and watering, managing light exposure and humidity, transporting, cloning, pruning, flushing, harvesting, curing and sometimes even trimming. As you can see, cannabis cultivation isn’t a simple process, in fact, it’s a job that demands only the most qualified, resourceful individuals. Working as a trimmer is a great place to start in pursuing a career in cannabis cultivation, as trimmers frequently work in or around grow operations and can observe much of the cultivation process. Additionally, trimmers spend some of the most time with cannabis flower of any job in the industry and can immediately identify buds picked to early, late or at peak concentration. Since concentrates and edibles are so popular, a demand for more cannabis extraction technician jobs and edibles chefs job has made itself evident. Like trimmers, extraction techs are responsible for processing cannabis past its harvest stage and must know how to optimize cannabinoid concentration and create a pure, consistent product. Concentrate creation calls for detail oriented workers who are good with their hands, making it a great avenue for experienced trimmers looking to move forward in their careers. Keep in mind, however that concentrate creation carries the threat of danger due to fire risks. Cannabis infused edibles are another method of consumption that is selling out on dispensary shelves. Unlike the brownies of yore, edibles in the modern day run the gamut from pasta sauce to raspberry smoothies. Virtually any food or drink item can be infused with potent cannabutter of CO2 extractions that will please your taste buds and chill you out. Both concentrate and edibles creators make salaries anywhere from $28,000-40,000 for entry-level workers to over $100,000 in the case of high level cannabis extraction technicians — much higher payouts than marijuana bud trimmer salaries. Many trimmers dream of securing advanced positions in the distribution sector by managing or owning cannabis dispensaries. Marijuana bud trimming salaries may be able to support workers who or single or do not have major expenses, but often, trimmers find they need a career that offers a little more stability. Dispensary management can provide just that by offering salaries around $50,000 for those with experience. Dispensary managers are expected to interview and hire employees, as well as train them and lead them through the daily motions of assisting customers. Managers are also responsible for keeping up with partnerships between their dispensary and grow operations and processing companies. Additionally, they perform inventory related tasks, solve customer and employee related concerns, as well as working as budtenders or receptionists when needed. Dispensary owners take on a heavy risk when deciding to establish a legal cannabusiness. Fraught with convoluted legislation, the industry is tough to navigate and requires entrepreneurs who know business and know cannabis like the back of both their hands. While some dispensary owners contract out marijuana consulting jobs, they still are the most responsible for the success or failure of their business. As a whole, the legal cannabis industry is set to undergo an interesting future under the current presidential administration. While it’s unlikely that any of the existing laws will be rescinded, it’s debatable how much headway will be made against the failed, yet somehow continuous “war against drugs” by conservative dissenters. Cannabis is still a Schedule I substance and has a lot of stigma to shed in the desire for comprehensive legalization. Marijuana bud trimmer salaries will likely follow the trend of other jobs in the industry, but hopefully employers will realize the importance of having a competent trimming staff. Especially if customers continue to expect exemplary quality from the products they purchase, the cannabis community must band together to continue to support the business in order to provide easy access for recreational and medical cannabis to consumers and patients.